Hope you are having a wonderful week. Happy Diwali to all my Indian friends and other friends celebrating Diwali. Celebrate with fun, love, laughter and safety too. 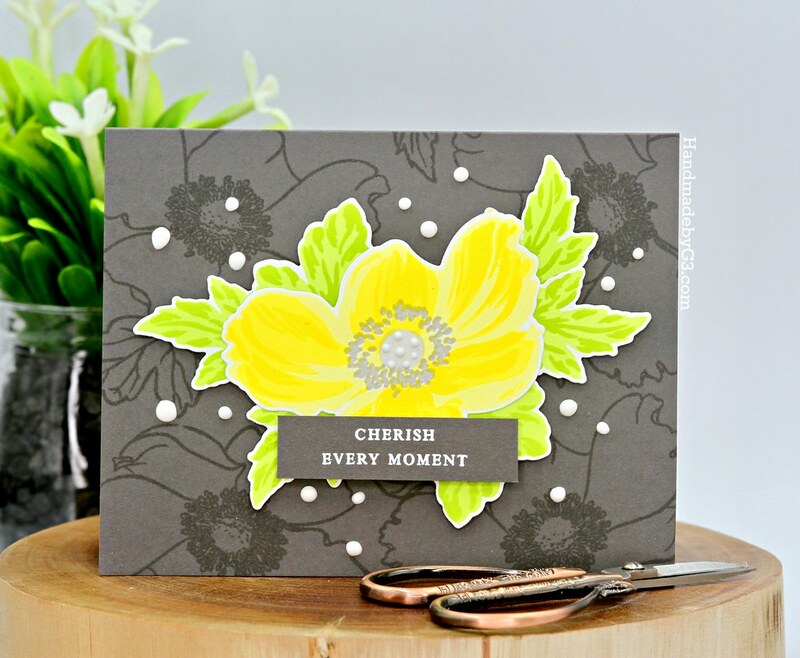 Today I am sharing two sets of cards using Altenew’s Build a Flower Anemone stamp and die set. 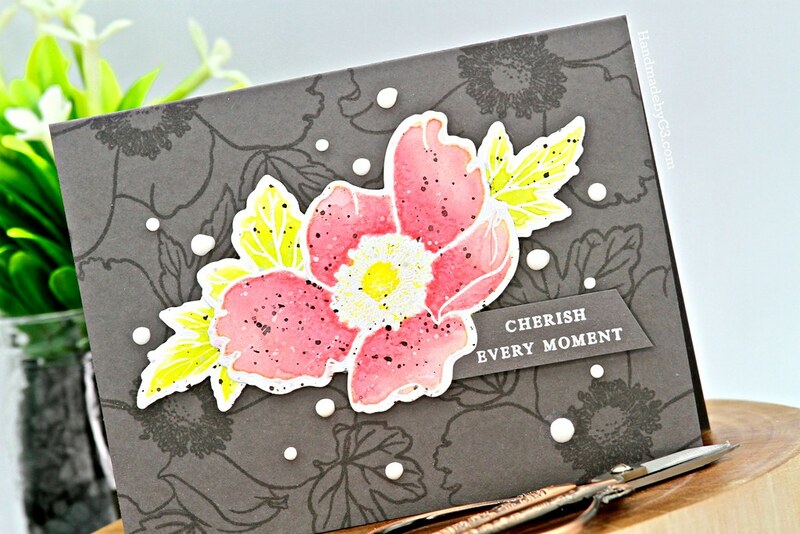 Love love the big Anemone flowers in this set. Of course this set is a layered floral set from Altenew. 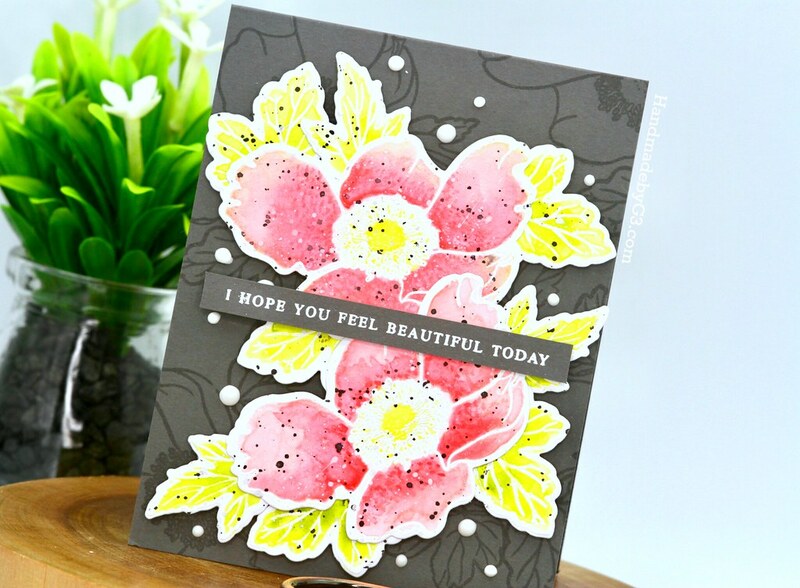 For the first set of cards, I used the outline images of the flowers and leaves to white heat emboss and watercolour using Altenew’s Watercolor Pan set. 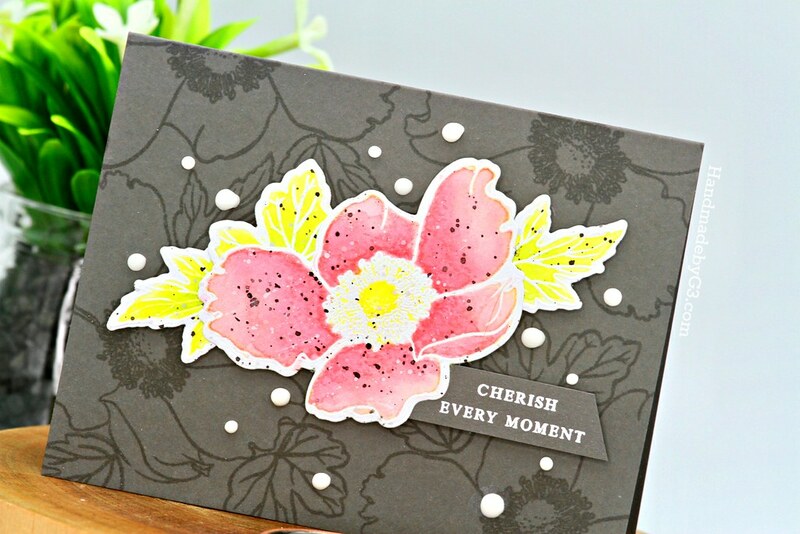 I die cut the watercoloured embossed images using the coordinating dies and made them into clusters. I used two clusters on this card. 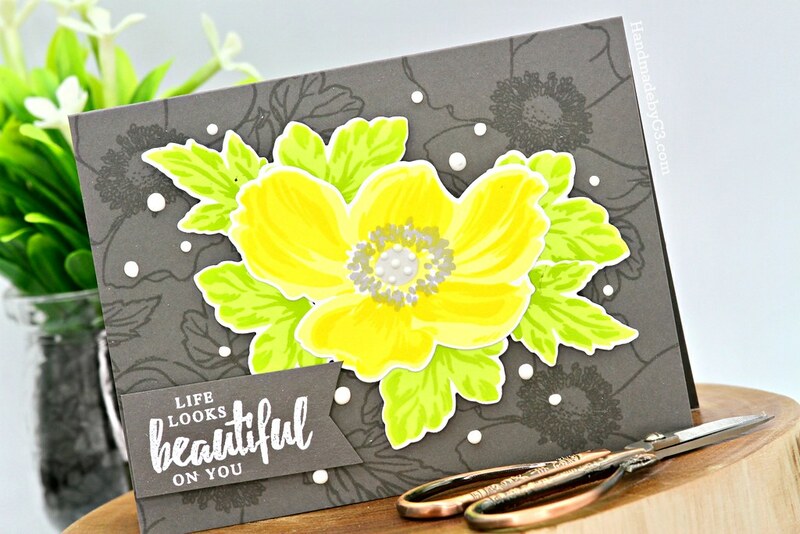 For the background, I decided to do some tone on tone stamping. 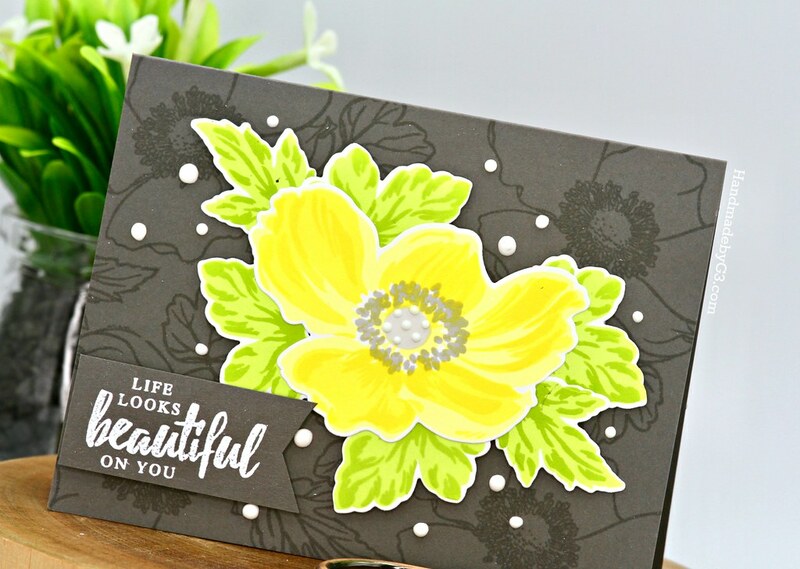 So used the same outline images from the stamp set to stamp using versamark ink on Simon’s Slate cardstock. This gives a subtle but interesting background upon which I adhered the two floral cluster using foam adhesives. I white heat embossed the sentiment on a strip of the same Slate cardstock and adhered it using foam adhesive right in the middle of the cluster. Finally some white Nuvo crystal drops randomly around the floral cluster to finish the card. I had one more cluster left. So I made another card. 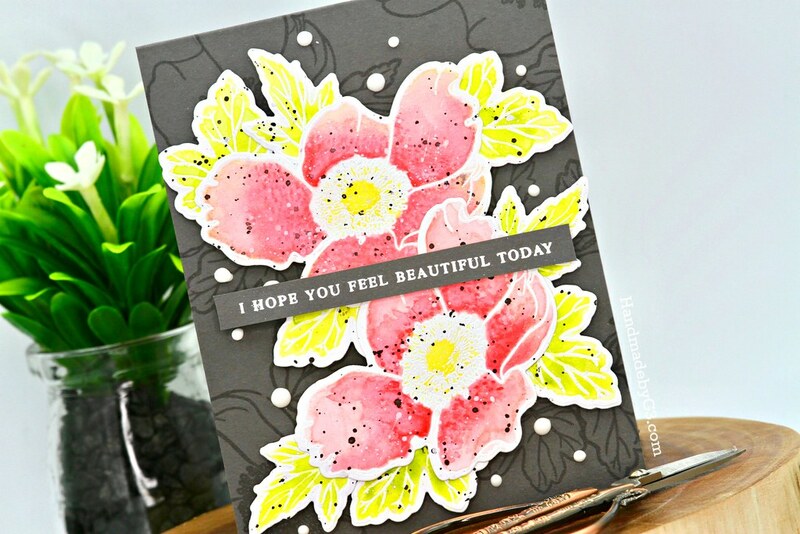 The elements are exactly the same in this card except the card is landscape with one floral cluster and a different sentiment from the stamp set. 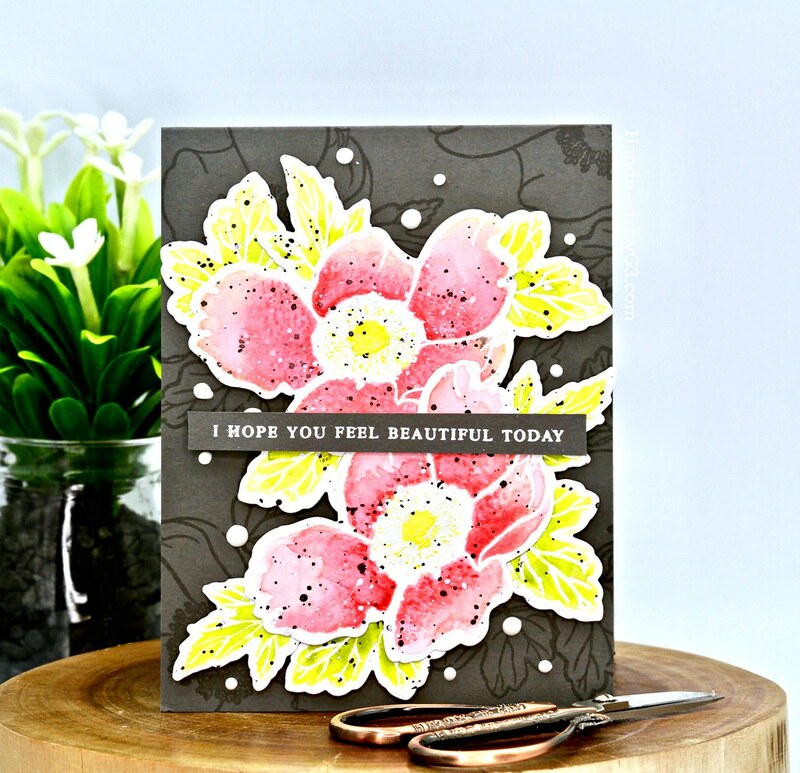 For the next set of cards, I used the layering images of the flower and leaves to stamp a bunch of them. 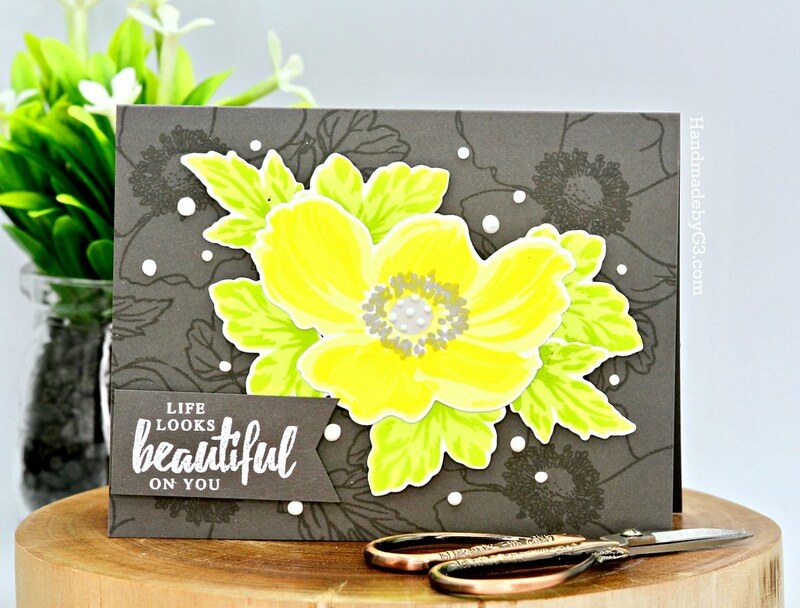 I used the three lightest yellow from Pocketful of Sunshine cube set to stamp the flowers and the two lights shades from Tropical Forest ink cube set for the leaves. Then die cut them all using the coordinating dies. The cards are similar to the first set in terms of layout. Same background on the cards. 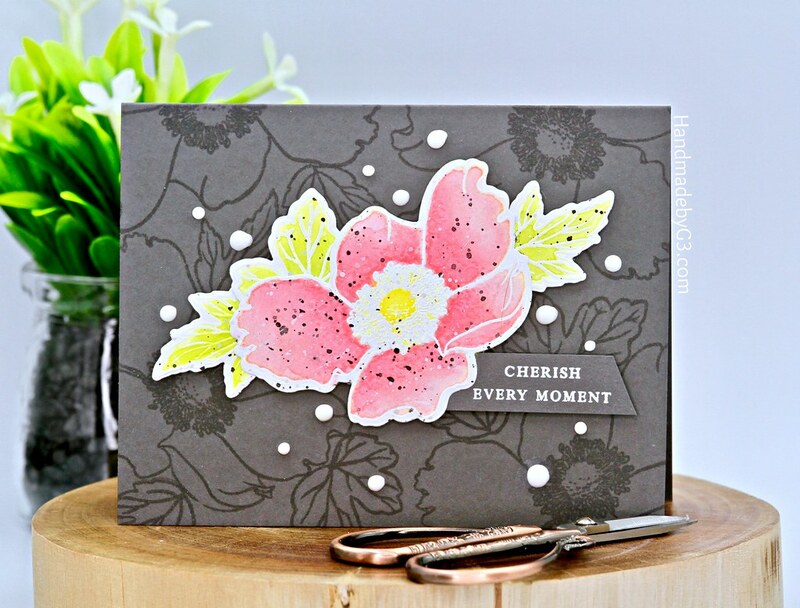 Stamped the outline images using versamark ink to get the tone on tone background. 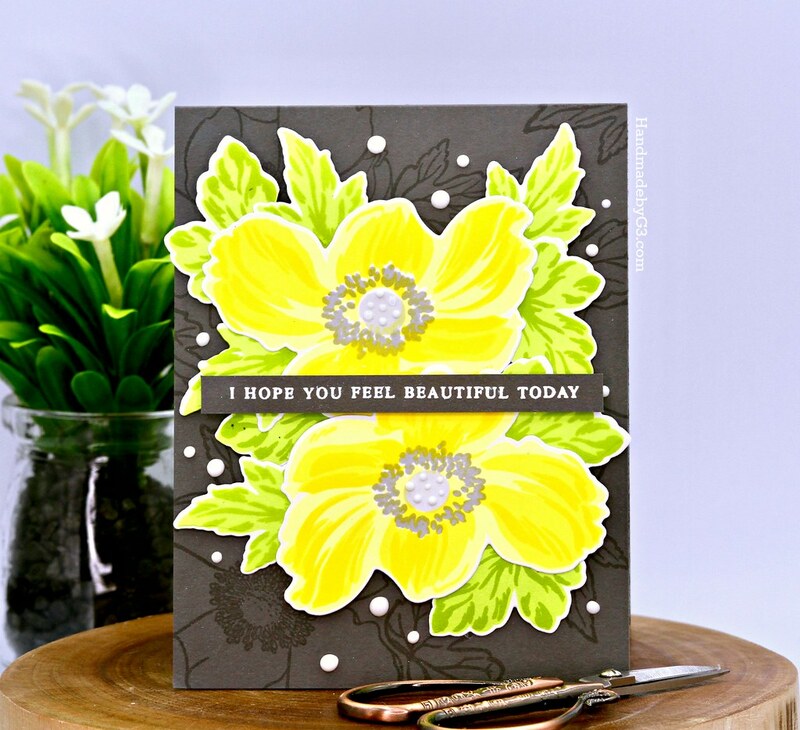 Love how the yellow flowers and green leaves pop against the dark grey background. 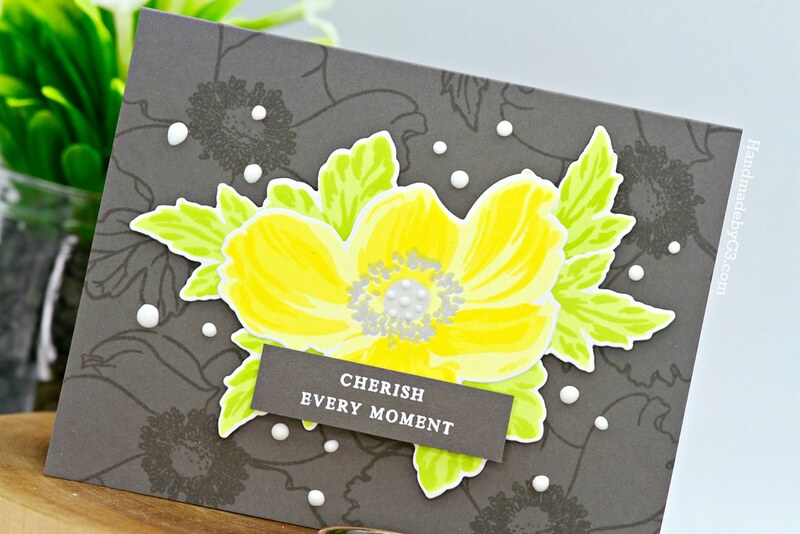 I chose the Slate Gray cardstock because I wanted the contrast but not too stark unlike the black background. 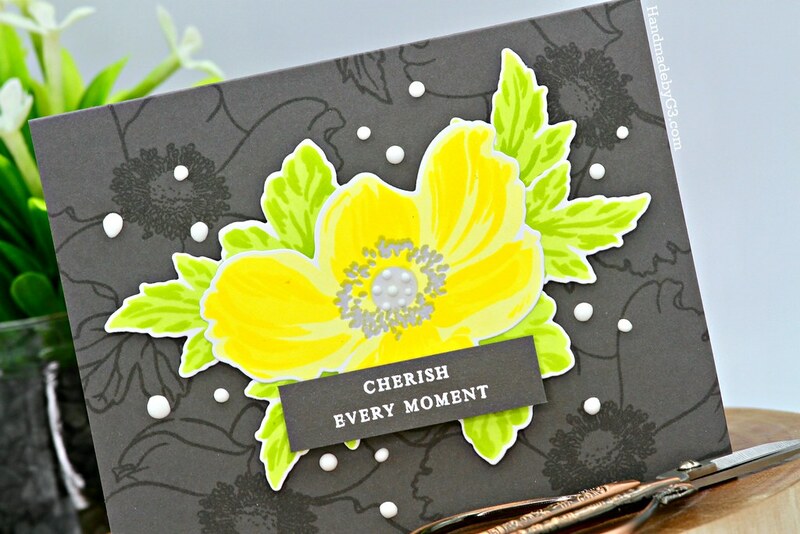 Same sentiment white heat embossed on a strip of Slate Gray cardstock. And to bring all the white together, I added white Nuvo Crystal drops. If you want even less of the contrast, you can choose lighter shades of grey cardstocks like the smoke gray or fog from Simon. I had two more floral clusters left. So made two more cards in landscape design except changing the sentiments. I was in a creativity rut over the weekend. Kind of done creating Diwali and Christmas cards although I still need a few more Christmas cards done. Just making a set of cards which are not for any assignments without deadlines brought back my creativity. I enjoy the creative process. Sometimes I just need that to rejuvenate. Now, I am wanting to do more cards. Most of all I want to colour. Probably a colouring marathon session tonight! I hope you found these set of cards refreshing too. 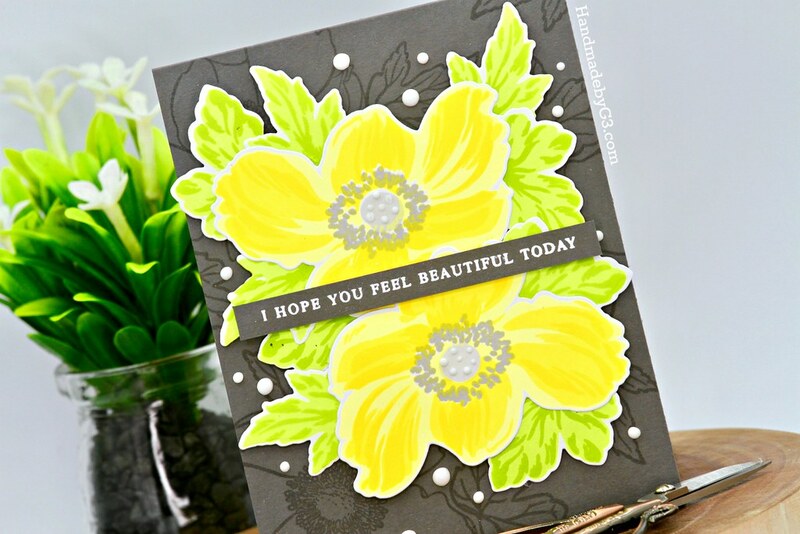 All supplies used to make these cards are listed below. Thank you very much if you visited my blog post. Much appreciated! Happy Deepavali to you too Gayatri. These are beautiful! Loving those big blooms!